A God-honoring study of botany. Content includes the process of classifying plants, development of plants from seeds, the reproduction processes in plants, the way plants make their food,how plants get their water & nutrients and distribute them throughout the plant. Save 10% when you purchase the Apologia Advantage Set™ – Botany with Regular Notebooking Journal. This set contains: Exploring Creation with Botany text & Exploring Creation with Botany Regular Notebooking Journal. Please note, this set contains the Notebooking Journal recommended for grades 3-6. Exploring Creation with Botany is part of the award-winning Young Explorers Series--voted the #1 homeschool science curriculum for over 10 years in a row. This set is not eligible for additional discounts. 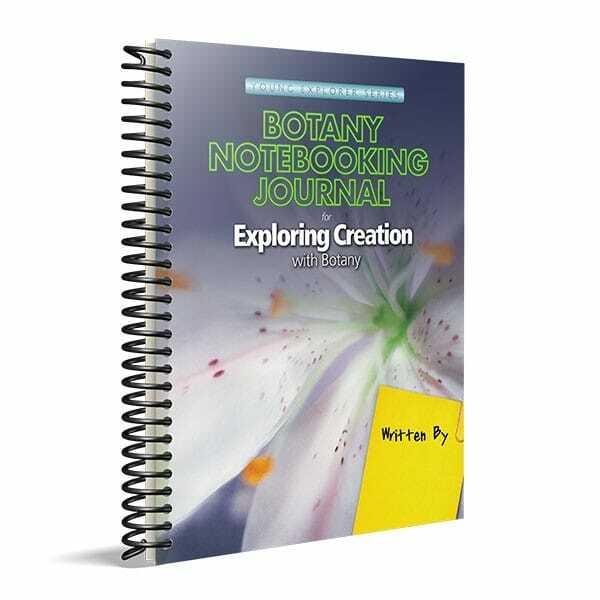 Additional Notebooking Journals or Junior Notebooking Journals for Exploring Creation with Botany may be purchased in the same order as this set for 10% off regular retail price. These Notebooking Journals are a perfect compliment to the Exploring Creation series. Each student will cherish their individual notebook as they make it their very own with words and illustrations reflecting all they have learned in their pursuit of science. Additionally, it serves as your record of your student’s scientific endeavors throughout the year. When your child flips through their notebook, they will be reminded of the knowledge they have attained, reviewing the material as they peruse the pages they have created. A perfect complement to Exploring Creation with Botany, the Botany Notebooking Journal provides everything your student needs to complete his study of botany. Not only does it include all the wonderful features of the other notebooking journals, it also includes an alternative Cold Climate Schedule as well as many additional activities, projects and experiments that can be completed in one day or less. This notebooking journal will serve as your child’s individual notebook, providing a place for him to complete every assignment in the text. He will illustrate and record fascinating facts and information learned during each lesson, complete the notebooking assignments on specially designed templates, record experiments, activities and projects, complete vocabulary crossword puzzles, put together beautifully designed miniature books, and more! Your child will treasure his notebooking journal as he makes it his very own with words and illustrations, reflecting all he has learned in his pursuit of science. Additionally, the journal will serve as your record of your student’s scientific endeavors throughout the year. When your child flips through his notebook, he will be reminded of the knowledge he has attained as he peruses the pages he has created. A variety of activities include full-color mini-books, additional fun experiments, crosswords, and supplementary materials. Recommended for use with students who have mastered handwriting, can take notes, and enjoy upper elementary level activities. A variety of activities include full-color mini-books, additional fun experiments, crosswords, and supplementary materials. Recommended for use with students who have mastered handwriting, can take notes, and enjoy upper elementary level activities. The full-color, spiral-bound Notebooking Journal includes daily lesson plans, artful graphics, imaginative writing prompts, puzzles, activities, and mini books. SCROLL DOWN THIS PAGE TO THE DOWNLOAD SECTION TO VIEW SAMPLES OF THE TEXTBOOK, JUNIOR NOTEBOOKING JOURNAL, AND MORE. Jeannie Fulbright, author of the Young Explorer Series, discusses immersion learning.